NanoBiotech Laboratory (NBL) has been interested in developing novel microfluidic and lab-on-a-chip devices as a new platform for biological sample processing, separation, and detection. Microfluidics is a key technology for the realization of micro total analysis systems (μTAS) and lab-on-a-chip in the areas of drug discovery, medical diagnostics, and tissue engineering due to several advantages such as precise fluid handling, low reagent consumption and potentially massive parallelization of experiments. In particular, microfluidic cell culture allows control of fluid flow on the micrometer-scale on the basis of diffusion transport and provides more in vivo-like environments for organ function-on-a-chip. Our recent development of microfluidic analytical technologies includes optoelectrofluidics, hydrophoretic separations, magnetophoretic assays, and microfluidic immunohistochemistry. Currently, we are focusing on the practical aspects of microfluidic diagnostic devices and multicellular 3D assay platforms. 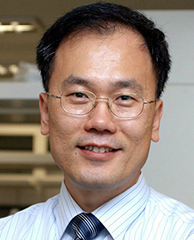 Since June 2008, his laboratory has been selected to receive a National Leading Research Laboratory Program grant through the National Research Foundation of Korea, funded by the Ministry of Science and ICT. Conventional immunohistochemistry (IHC) process is difficult to standardize for quality assurance of the test, which was subjective and qualitative. In particular, immunostaining quality is highly variable among laboratories, technicians, and protocols. Moreover, there is no effective system for verifying and standardizing IHC testing. To address this problem, we first developed a microfluidic immunostaining system which enables standardization and quality assurance of cancer diagnostic test [Scientific Reports, 2017, Vol. 7, 45968]. We also report a simple and easy-to-use microfluidic IHC platform based on the operation of a manual pipette [Lab on a Chip, 2017, Vol. 17, No. 4, pp. 702-709]. This simple pipetting-based approach allows end users to better use microfluidic IHC in real-world environments. 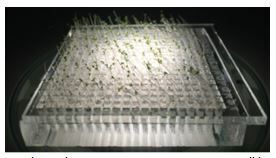 We report a novel plant array chip suitable for testing various environmental factors that affect seed germination and seedling growth in a small space [Lab on a Chip, 2017, Vol. 17, No. 18, pp. 3071-3077]. There is an unmet need for a multi-purpose, standardized platform that is capable of observing various phenotypes besides root. The proposed array chip allows the tracking of an individual seed in spatially partitioned arrays of solid medium blocks and provides a solution for the spatial limitation of conventional experimental setups that require a large space to test many conditions. We expect this platform to be widely used for various purposes, including germination test, stimuli screening, and pesticide screening in both industry and academia. 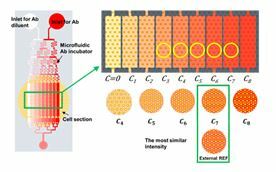 We describe a new approach for multicellular analysis using a microfluidic assembly platform based on the cell-containing hydrogel sheet, which can be integrated as an interposed module in a microfluidic device [Scientific Reports, 2017, Vol. 7, 1289]. After simultaneously obtaining multi-labeled cells in the hydrogel sheet, each modular hydrogel sheet is recoverable and recultured without any distortion. 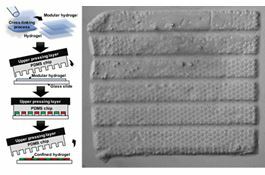 The modular hydrogel sheet can be simply manipulated and conserved as a multicellular module in a 3D in vitro culture platform. Using the modular concept of hydrogel sheet capable of cell culture and assay, an integrated multicellular analysis in the microfluidic device expects to improve accessibility, scalability and practicality for end users. We present vertical flow assays (VFAs) with multistep reactions based on the programmed reagent loading using a pressed paper [Sensors and Actuators B: Chemical, 2017, Vol. 246, pp. 1049-1055]. In this work, a pressed paper was integrated into a 3D paper-based microfluidic device to simplify complicated operation principle of VFAs and to handle multistep reactions by delaying the flow. The reagent loading order was easily changed by controlling the amount of applied pressure as well as the geometry of the paper channel. By loading all reagents simultaneously, each reagent was loaded into the test regions in the programmed order. As a target analyte, high sensitive detection of C-reactive protein was demonstrated for the prediction of cardiovascular diseases in a clinically relevant rage (0.005–5 μg/mL) without Hook effect. 1. C. Y. Bae, J. Son, H. Kim, and J.-K. Park, "Demonstration of interposed modular hydrogel sheet for multicellular analysis in a microfluidic assembly platform," Scientific Reports, Vol. 7, 1289, May 2017. 2. J. Park, J. H. Shin, and J.-K. Park, "Pressed paper-based dipstick for detection of foodborne pathogens with multistep reactions," Analytical Chemistry, Vol. 88, No. 7, pp. 3781-3788, April 2016. 3. M. G. Lee, J. H. Shin, C. Y. Bae, S. Choi, and J.-K. Park, "Label-free cancer cell separation from human whole blood using inertial microfluidics at low shear stress," Analytical Chemistry, Vol. 85, No. 13, pp. 6213–6218, July, 2013. 4. W. Lee, C. Y. Bae, S. Kwon, J. Son, J. Kim, Y. Jeong, S.-S. Yoo, and J.-K. Park, "Cellular hydrogel biopaper for patterned 3D cell culture and modular tissue reconstruction," Advanced Healthcare Materials, Vol. 1, No. 5, pp. 635-639, September 2012. 5. E. Um, E. Rha, S.-L. Choi, S.-G. Lee, and J.-K. Park, "Mesh-integrated microdroplet array for simultaneous merging and storage of single-cell droplets," Lab on a Chip, Vol. 12, No. 9, pp. 1594-1597, May 2012. 6. M. S. Kim, T. Kim, S.-Y. Kong, S. Kwon, C. Y. Bae, J. Choi, C. H. Kim, E. S. Lee, and J.-K. Park, “Breast cancer diagnosis using a microfluidic multiplexed immunohistochemistry platform,” PLoS One, Vol. 5, No. 5, e10441, May 2010. 7. H. Hwang and J.-K. Park, "Rapid and selective concentration of microparticles in an optoelectrofluidic platform," Lab on a Chip, Vol. 9, No. 2, pp.199-206, January 2009. 8. 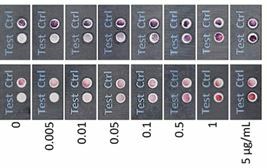 S. Choi, S. Song, C. Choi, and J.-K. Park, "Sheathless focusing of microbeads and blood cells based on hydrophoresis," Small, Vol. 4, No. 5, pp. 634-641, May 2008. 9. J. H. Kang, S. Choi, W. Lee, and J.-K. Park, "Isomagnetophoresis to discriminate subtle difference in magnetic susceptibility," Journal of the American Chemical Society, Vol. 130, No. 2, pp. 396-397, January 2008. 10. K. S. Kim and J.-K. Park, "Magnetic force-based multiplexed immunoassay using superparamagnetic nanoparticles in microfluidic channel," Lab on a Chip, Vol. 5, No. 6, pp. 657-664, June 2005.